UNITED STATES: Duke Energy is installing an avian-detector system at its 200MW Top of the World project in Wyoming -- just over four years after pleading guilty to violating bird protection laws there. The firm will fit 24 IdentiFlight units at the 200MW site, becoming the first wind power developer to deploy this technology. The system from IdentiFlight International uses sensor arrays and artificial intelligence algorithms to automatically process images in real time, relaying information to project operators. "Duke Energy understands the importance of balancing the need for clean, renewable energy while protecting wildlife, including the iconic bald and golden eagles," said Tim Hayes, environmental director of Duke Energy Renewables. Early versions of the IdentiFlight technology were tested at Top of the World, and more advanced configurations underwent third-party independent testing at the 110-turbine site during increased eagle activity. 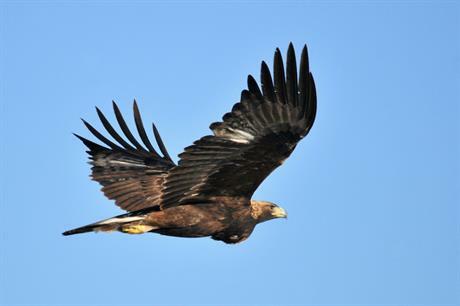 The system can detect and classify golden eagles and other large birds giving information to the operator, which can lead to curtailed production and minimising collision risk. A report on the results of testing is due to be published in a scientific journal early next year, IdentiFlight stated. In November 2013, Duke Energy pleaded guilty to violating the Migratory Bird Treaty Act (MBTA) following 163 bird deaths, including 14 golden eagles, at the Top of the World site and at its 99MW Campbell Hill project, also in Wyoming. It was fined $1 million and ordered to adopt a migratory bird compliance plan at all of its Wyoming projects. Utility PacifiCorp Energy had also pleaded guilty to violating the MBTA. But in December 2017, the US Department of the Interior (DoI) ruled that the Act was established to protect migratory birds, and "does not prohibit incidental take", meaning deaths "that results from an activity, but is not the purpose of that activity". "Incidental take" would include activities such as wind farm or solar park development, the DoI affirmed. According to the latest US Fish and Wildlife Service (FWS) figures for "human-caused threats to birds", which were last updated in May 2016, collisions with wind turbines account for approximately 174,000 bird deaths every year. By comparison, the estimated figures show 25 million birds are killed every year after colliding with electrical lines; 750,000 die in oil pits; while cats kill an estimated 2.4 billion birds per year, making feline predators the greatest threat to US birds.